Every gaming entity regardless of size or number of properties strives for uniformity of message, look and theme. It’s critical that all your promotions and collateral reflect your image precisely and with consistency. Graphic look is one major component. Some properties like a variety of styles while others have very specific graphic standards. Copy is also vital. Not only does it need to be well written, it must capture the essence of your casino. It has to talk to your players and communicate your message. For stand-alone casinos it means always producing quality creative that best represents you. For larger companies with many casinos you don’t want to diminish creativity at the property level. You do want to ensure that same and cross property communications are consistent in message, look and tone. That’s something we understand. 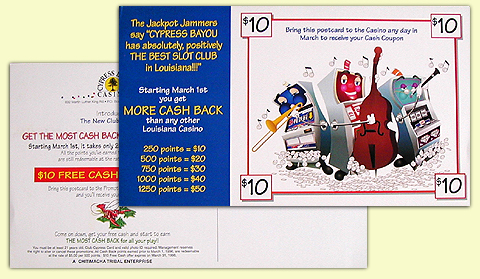 Prior to opening, Cypress Bayou Casino wanted to create a unique identity for their players club. Located two hours from New Orleans they wanted to effect a subtle jazz tie-in. They wanted their players club to “come alive!” We created slot characters that became the club’s mascots. Through a series of signage, contests and collateral we launched the club and brought it to life. 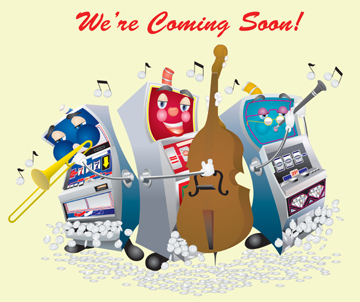 Players can tell right away when there’s a Cypress Bayou players club promotion in their mailbox! 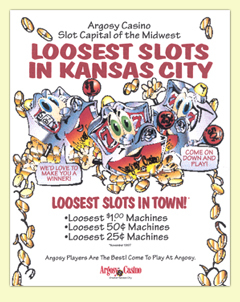 Argosy Casino in Riverside, Missouri wanted to reinforce its “loosest slots” leadership position in their market. They had a great story to tell and needed to make sure players heard it! 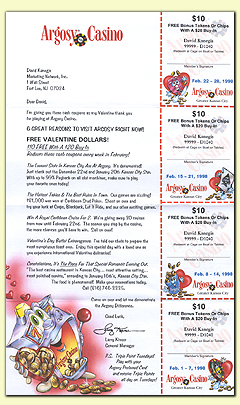 They wanted to ensure that the words Argosy players club evoked lots of slot machines and lots of winning. They chose a cartoonish look to represent their club. We created graphics and copy that delivered the goods. Harrah’s Entertainment is a great example of a large corporation wanting to guarantee uniformity in players club communications. They run many company-wide promotions and have an extremely sophisticated database. They also have many agencies on retainer assigned to handling corporate and property level advertising. Yet when it came time to create a company-wide Total Rewards® Letter Library they turned to us. They wanted consistency of message and style in all their communications. And it had to be done in a way that allowed each property the autonomy to add in their individual promotional messages. In essence it’s a multi-faceted template that provides each property with guidance in addressing their heavily segmented player base. We can’t show you examples of the library because it’s proprietary, but we can provide references to attest to its success. Harrah's Corporate also turned to us when they wanted to introduce their newest and highest level of Total Rewards® players club recognition. This elite level known as the Seven Stars Club is reserved for the créme de la créme of their players. Marketing Network, Inc. was asked to write the copy for both the Seven Stars Club capabilities brochure as well as the individualized copy coming from property General Managers to their best and most valuable players. Whatever the message you want to convey, we’ll do it in your style and with consistency. It all comes back to marketing, understanding what client’s want and need and most importantly the skill to deliver. Let us demonstrate what we can do for you. Call (800) LUCKY SLOTS or contact us at: Brand Identity. Lee Torres, Relationship Marketing Specialist, Harrah’s Entertainment, Inc.